Figure 2.2 shows the time-space variability of zonally averaged net radiation flux at the upper atmospheric boundary. 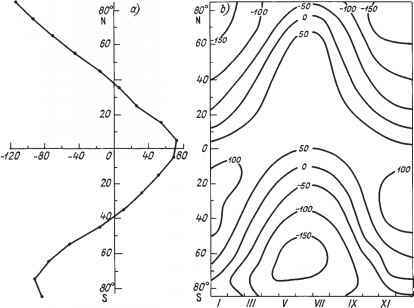 Note three features: asymmetry of seasonal oscillations which is most distinct in high latitudes in both hemispheres, the local winter maximum in tropical latitudes in the Southern Hemisphere and marked increase in seasonal oscillations in the Southern Hemisphere compared with the Northern Hemisphere. The first and third features are connected to the specific character of the spatial distribution of the outgoing long-wave emission; the second feature is due to an increase in assimilated short-wave solar radiation because of a reduction of the planetary albedo. The same features are inherent in net radiation flux at the surface of the World Ocean (Figure 2.3), though they manifest themselves less distinctly than in net radiation flux at the upper atmospheric boundary. The cause of this is a reduction in the effective emission of the ocean surface due to the existence of downward long-wave atmospheric radiation. The same cause explains the total increase in net radiation flux at the ocean surface compared with its value at the upper atmospheric boundary. where here, and above, TA is the air temperature, L is the heat of condensation, cp and cv are the specific air heat for constant pressure and volume; the remaining designations are the same. where c and T are the specific heat and temperature; m is the mass of a column with unit area; L, is the heat of melting (sublimation); subscripts O and L signify belonging to the ocean and land, double superscripts OS and LS signify belonging to the ocean and land surfaces, the symbol signifies, as mentioned above, averaging over the mass of the ocean or over the mass of the active land layer. 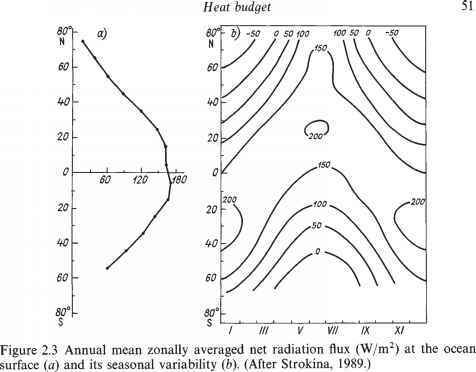 reduction in the latent heat flux). In the Northern Hemisphere the heat inflow from the atmosphere is lower and the heat transfer from the ocean into the atmosphere is higher than in the Southern Hemisphere. The seasonal variability of the resulting heat flux in the Northern Hemisphere also appears to be greater. 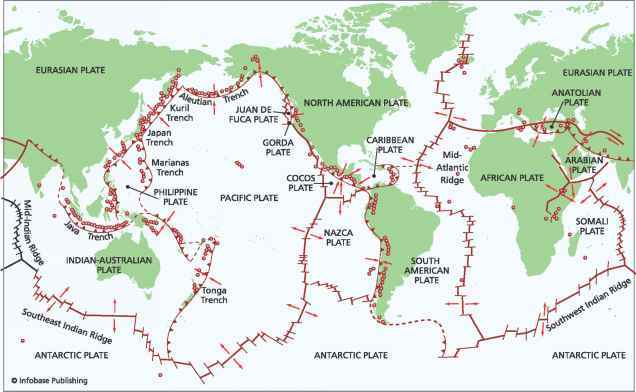 This feature can be explained by the difference in the ocean/land area ratio in both hemispheres. 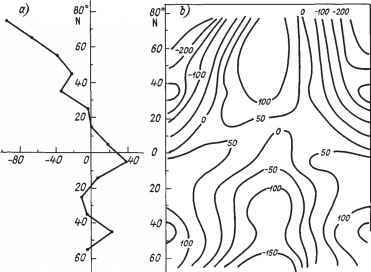 8t where v, is the horizontal vector of the sea ice drift velocity. (foCoMoVoTo + fmrtiiVi + f'LcLmLvLTL)a cos q> d<p o is the meridional sensible and latent heat transport in the ocean and active land layer; v0, vI and vL are the meridional components of current velocity, of sea ice drift and of river and ground water movement; f'Q, f[ and f'L are fractions of the ocean, sea ice and land in the zonal belt of the unit meridional extent.